I am always late… I am late because I always leave late as I never have enough time to get ready for going out, and in the very last moment I see that my shoes are dirty or there is a big spot of coffee on my clothes. When I am getting ready to go out, I turn on my favorite music or talk on my cell phone with my boyfriend Kip. I can never remember where I left my jeans the day before and what lectures I am gonna have today. Sometimes I realize that I forgot to have breakfast, so I have to go to the kitchen and find something to eat. If it is raining, I am usually desperately late because I can never find my umbrella. Being late and always running behind the schedule is quite a common problem in our modern society. Many people have lack of punctuality and are often at least 20 minutes late for offices, appointments, church, lectures, or dates. 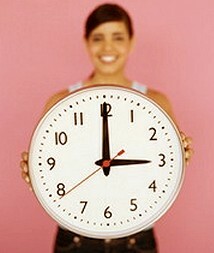 This tardiness makes us turn on all our creativity and make up endless plausible excuses for our being late. Also, it makes other people angry and causes numerous useless stresses. Chronic latecomers usually justify their habit of being late by a great variety of reasons, starting from heredity (“My mom is always late, and so am I”) and ending with our natural inner clock (“I am not a morning person, what can I do?”) or the basics of morality (“I have no bad intentions and do not want to hurt anyone. It just always turns out this way!”). Well, if you are reading this page, you must be well familiar with this problem. The specialists say that every sixth person in our country suffers from being late too often. Chronic lateness is a complex and quite hard problem to fight with, however, tardiness always affects the quality of your life, your state of mind and the life of people around you. Just like me, sooner or later you will have to face the necessity to change yourself. Taking into account my own experience, I would like to guide you on your way to overcoming your tardiness, help you identify the reasons of your chronic unpunctuality and offer some effective techniques that really work! All you will need to do is just be determined, positive, optimistic, and follow my easy steps to improve yourself. While you are still hesitating whether it is worth spending your efforts and walking into a fight with yourself for becoming more punctual, I can try to assist your decision with some more ideas to think about. First off, remember that EVERYONE without exceptions has abilities to be on time. Have you ever been late to the airport to take your flight? I do not think so, because you know so well that in overwhelming majority of the situations the plane will take off in time, with or without you on board. Second off, I guarantee that improving your self organization, punctuality, abilities to prioritize and adhere to your plans will require some efforts of yours only in the beginning. You will have to spend no more than 20-25 minutes a day for making schedules and notations about your daily activities. But very soon you will master the main rules and ideas of proper time management and it will be easy for you to make all this calculations and plans simply in your mind. Finally, do not forget that your habit is also very harmful from a social perspective. By being always late and putting your things repeatedly on hold you make the life of people around you quite uncomfortable. Your friends have to wait for you, your colleagues have to cover up for you, your instructors have to give you bad grades (believe me, they do not take pleasure in doing this!) and the people you truly love do not receive the care you are able to give them. We all really need to do a lot of things in this life, and if we do not procrastinate, our life would be much easier and more enjoyable! Do not put off making important decisions anymore, do not lie to yourself anymore and act – right now!